But when you hear the steps crunching in the snow and the Christmas lighting is sparkling in the alleys, you see the Christmas Market with different eyes. Then you are curious whether there is new handicraft to marvel at again this year, whether the chestnut trolley still bakes fine, hot chestnuts, whether the Winzerglühwein (winemaker mulled wine) still tastes as good as last year and whether the potato fritter stall is there again. Children’s eyes sparkle when they see the Santa Claus floating in the hot air balloon arriving. Young people browse at the Allgau cheese stall because they absolutely have to sample everything until they know precisely what they could give to their grandparents as presents. Small children stand in front of donkeys and sheep that patiently let themselves be stroked while others in the hut next door are trying to bake biscuits. All of this produces a pre-Christmas season feeling. 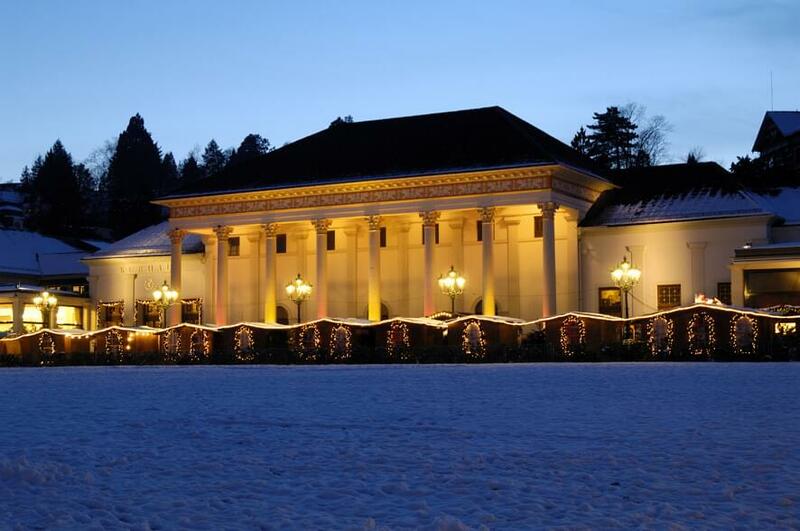 Please be aware to book early in advance during the season of the Christmas Market Baden-Baden.